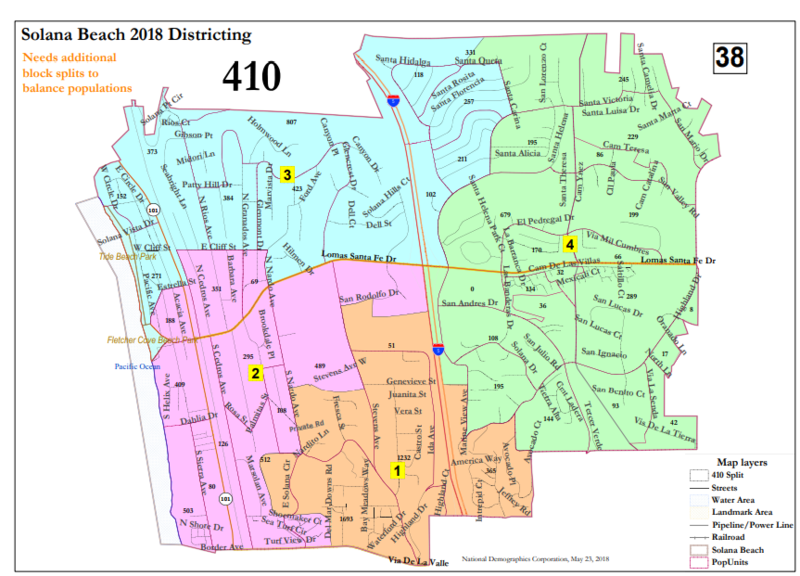 SOLANA BEACH — As the city works to switch to district-based elections, council members at a May 30 special meeting opted to move forward with two maps that would result in four districts and a mayor who would be elected rather than appointed. “I think that’s unfortunate,” said Kevin Shenkman, the Malibu-based attorney who in a February letter threatened litigation if Solana Beach didn’t abandon at-large elections. As such, the city is violating the California Voting Rights Act (CVRA) of 2001. Shenkman sent similar letters to jurisdictions throughout Southern California. His firm successfully sued Palmdale in 2012 for violating the CVRA, costing the city millions of dollars. Most San Diego cities have cited that lawsuit when deciding to change their election procedures. Solana Beach opted to comply rather than undertake what would likely be a losing and expensive legal battle. Two meetings explaining the process of creating districts were held last month. In less than two weeks residents submitted 39 potential maps, but more than half were not viable. A handful were deemed duplicative, and 16 did not follow election-law requirements. Council members were ultimately presented with 17 possible configurations. A little more than half split the city east to west. The others created quadrants that were oriented more north-south. Shenkman said the “push” to draw the lines from east to west is also problematic. Because election law requires each district to have an equal population, he said it makes sense to have five districts with approximately 20 percent of the population in each, especially since Latinos, who live primarily in and around La Colonia de Eden Gardens, make up about 16 percent of Solana Beach’s population. “When you have one concentrated Latino neighborhood that does not quite comprise 20 percent of the city, you’re combining more folks not in that one neighborhood,” Shenkman said. The goal of the May 30 meeting — the third of five required meetings — was to narrow the choices to one to four maps that will be presented June 26. Input during the public comment period was mixed, with the majority supporting five districts and an appointed mayor who rotates annually. Resident Manny Aguilar, speaking on behalf of La Colonia de Eden Gardens Foundation, said he supports a five-district map with a north-to-south configuration. 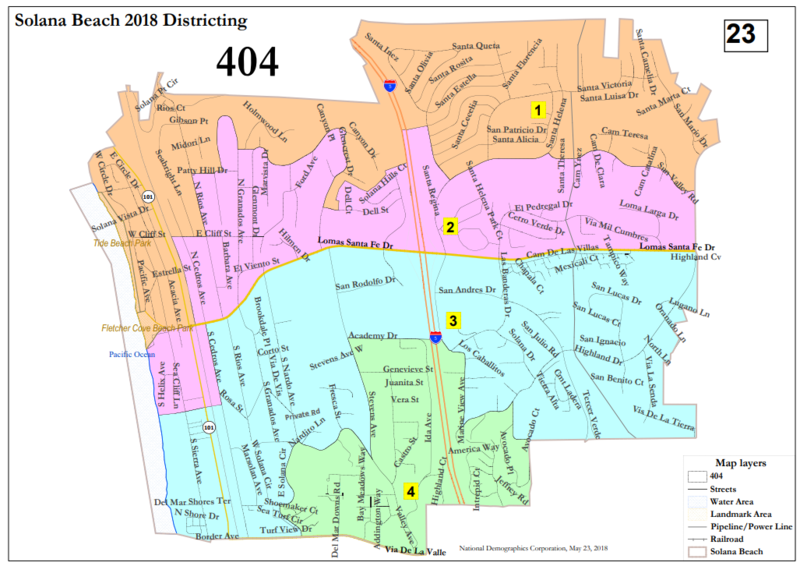 “I find it difficult to believe racial polarization is occurring in Solana Beach,” resident Lisa Montes said, adding that she supports a four-district map that separates the city into square-type quadrants. She said the city has been “quite receptive” to Eden Gardens by improving road safety for children walking to and from school, providing funding for a summer leadership camp and helping with the annual Día de los Muertos celebration. A representative from the Condominium Organizations of South Sierra Avenue said she favors a five-district map that won’t split the nine homeowner associations in the area. Vickie Driver said that same logic should be used for homeowner association east of Interstate 5. “Many maps seem to carve out our HOA and split it into two or three parts,” she said. “This is not acceptable … to have our neighborhoods divided. Council members said switching to an elected mayor will allow each resident to vote for two council representatives rather than one, especially since they have been used to electing five. They also said drawing the district lines east-west will allow each council member to have a say in the different areas of the city, such as the coast, Cedros Avenue and the commercial sections near the freeway. They also all seemed to agree it would be impossible to create a map that pleases everyone. “No matter which approach we take there … is no map up there that is not going to split some neighborhood,” Councilman Dave Zito said. “I think what’s most important is that we don’t pit neighborhood against neighborhood and that what we do generally is to make sure that the assets that we have are divided equally among the various districts so that each council member is working together with the other council member with common interests,” Councilwoman Lesa Heebner said. Douglas Johnson, from National Demographics Corporations, was hired to guide the city through the process. He is modifying the two maps chosen by council members and should be posting them on the city website soon. Council members and residents can weigh in until one week before the special June 26 meeting, when one map will be selected. It will be adopted July 11. Because of county deadlines, the changes will be phased beginning with the 2020 election.